Zero offset is the most important preparatory function of CNC milling machine. Zero offset milling machine Sinumeric system coded with G codes while programming zero offset, G54 codes called along with the program. CNC milling machine is having three axes X Y Z. The entire three axis are having zero point with reference to center point of milling machine table. Computer only knows the zero point of three axes. Jobs mounted on the working table. Before taking any machining operation machine zero is shifted to the job surface. The shifting of machine zero to work surface is called the zero offset or work offset. Sinumeric system zero offset codes with G54 G00 G01. Zero offset gauges fitted on the spindle and references distance of the entire three axis is noted and then the gauges touched on all the axis of the job. The point of contact on the axis by gauge attached is noted and subtracted from the reference point on the radius of the gauge and entered in zero offset pages on the entire three axis. Tool Offset on Milling Machine. 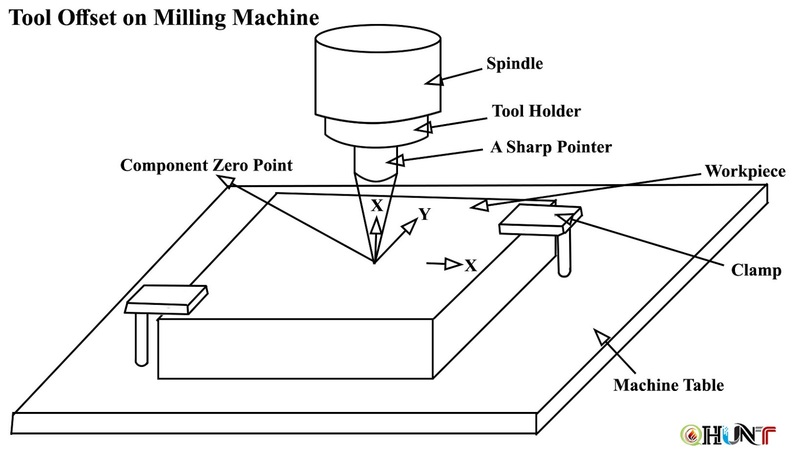 The procedure of offset setting on a miller /machining centre is similar to lathe machine. In fact, it is simpler because all the milling tools are held by the same spindle in the same manner for machining; resulting in the same X and Y offset distances for all the tools. The Z offset distances will, of course, be different, because the tools may have different lengths. So, whereas Z offset distances for all the tools need to be determined separately, X and Y offset distances are calculated for just one tool. It is, however, difficult to accurately align the axis of the tool with the desired component zero point, because the tools have finite diameters. 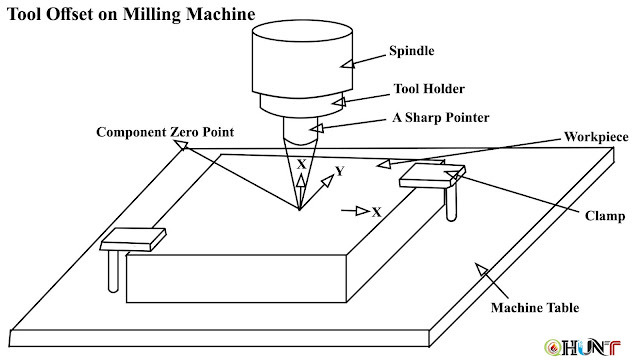 A way out is to use a sharp pointer instead, as shown in figure "Tool Offset on Milling Machine" below. This way, X and Y offset distances can be found out very accurately. The Z offset distances can be determined by making the individual tools touch the top surface of the work piece which is the usual choice for Z = 0. All the offset distances, along with the radius of the tool, can be stored in the tool offset table. The radius is required if radius compensation is to be used. The nose radius of a lathe tool is very small. So, nose radius compensation is not very critical. But, miller tools, such as an end-mill or a face-mill, have large diameters. We program the path of the axis of the tool, whereas cutting is done at the circumference of the tool. Naturally, the actual profile obtained after the machining will be offset from the desired profile by the radius of the cutting tool. So, it is necessary to shift the tool by a distance equal to its radius in a direction perpendicular to the desired profile. For male and female parts, the shifts should be in the opposite directions. That is why; both left hand compensation (G41) and right hand compensation (G42) are provided on a CNC machine. In the left hand compensation, the tool shifts to the left of the programmed path, whereas in the right hand compensation, it shifts to the right. Cutter Radius Compensation Given on 900 movement compensation, Angular movement compensation, Circular interpolation compensation, Radius angle combination compensation, Radius angle radius compensation. In CNC milling subroutine programming is done, where a simple operation is repeated. While programming it is denoted by (for example L0366). The first two digits 03 denotes the number of repetitions (01- 99) times as per the capacity of computer software, the next two digits 66 denote the program number. Suppose the program No. 10 is repeated for three times it is written as L0310. Parameter programming is one type of programming executed in CNC system. As in CNC milling, various machining cycles already stored in the form of software by the manufacturers. It depends as per the system adopted by the company. The milling cycles include parameters, these parameters (sinumaric system) denoted by R. R parameters of the software is in the form of machine language already stored in the computer. Once the parameter values are put in the computer automatically recognizes and stored as per programmed. R parameters are described and written in single block. These are 01 to 199 parameters are available; it may differ as per manufacturers. These parameters are declared in two ways i.e. direct declaration and indirect as per system. In CNC milling parameter to programming plays a vital role. (a) It helps an operator to program in short time. (b) It is very easy to understand. 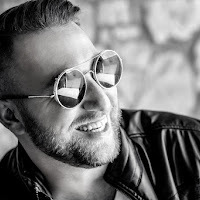 (c) It saves valuable time for programmer. (d) It used for complicated job of special contour with greater accuracy. (e) It used for mass production.